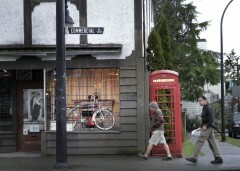 The tempo of street life on Vancouver’s Commercial Drive is an urban rarity. Pedestrians crisscross in and out of shops; social philosophers sip coffee at sidewalk cafes; cars slowly rumble along; and buskers set the scene to music. And then there are the steadfast cyclists who whiz up and down the bustling strip, riding the margin where the road meets the sidewalk. 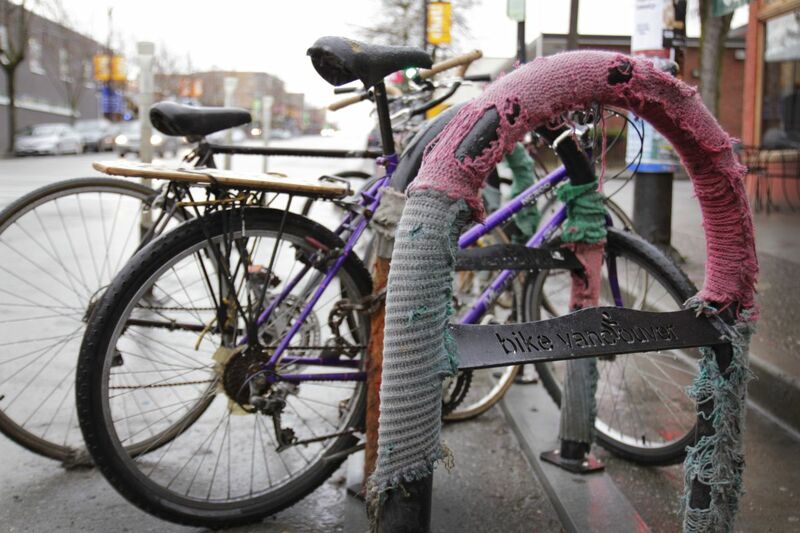 Vancouver’s cycling culture is thriving on Commercial Drive. On the corner of First and Commercial, a traffic light changes from red to green, and a motley crew of waiting cyclists disperses forward. A tenacious father in his 40s hauls a bright-eyed toddler in a bike trailer. Two scruffy friends in ripped jeans blast ahead on duct-taped mountain bikes while a woman in a floral-print skirt and rain boots meanders behind on a retro beach cruiser fitted with a brown leather saddle. The number of cyclists has been visibly multiplying in this neighbourhood, known locally (and perhaps ironically) as “the Drive.” Britannia Community Centre decided this growing demographic needed a social space where they could fix their own bicycles, learn new repair skills, or simply bond over the muscle-burning joy of conquering a hill. From the beginning, Rahi and Macdonald knew that they wanted their bike shop to be different. The initial plan was to house Kickstand inside a brightly coloured, 20-foot-long, steel shipping container, to be donated by the Longshoreman’s Union and plopped onto the Britannia Community Centre parking lot. According to Translink, Vancouverites make more than 100,000 bike trips every day. The large space is already filling up with spare parts and tools. Kickstand is parked in Asterino’s Catering building. Kickstand clients get to know their bikes. 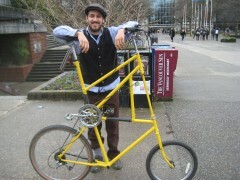 Kickstand is run by volunteers, many of whom are UBC students and alumni. A group of UBC environmental design alumni, called StudioCAMP, helped the Kickstand team adapt the vacant basement into a do-it-yourselfer’s haven. The UBC Student Environment Centre and Vancity provided start-up grants and, in September 2012, Kickstand opened its doors. Those who enter can expect to get their hands greasy because, unlike a traditional bike shop, Kickstand is built on the premise of empowering cyclists to fix their own bikes. The shop houses a handful of mechanic stands, on which patrons can perch their bikes for an all-angle attack. Those who enter Kickstand can expect to get their hands greasy. Joining a small fleet of similar spaces in the city, this is the first of its kind to be located east of Main Street. The organization is 100 per cent volunteer-run, powered by a team of 40 mechanics and shop staff – about half of whom are UBC students and alumni. In addition to drop-in hours, Kickstand offers after-hours workshops such as “Bike Touring 101” and devotes special attention to promoting youth participation. Rahi and other volunteers can often be spotted leading packs of 12-year-olds through the streets of East Vancouver as part of Kickstand’s after-school bike club program. Together with PEDAL Bike Depot, Kickstand also co-hosts an Earn-a-Bike program, where high school students learn to rebuild broken bikes and, afterwards, get to keep their finished creations. Rahi and other volunteers can often be spotted leading packs of 12-year-olds through the streets of East Vancouver as part of Kickstand’s after-school bike club program. John Hodges is a 16-year-old homeschooled student who participated in the Earn-a-Bike program last summer. “Before that, I had done basically no bike maintenance at all,” he says. “The process was fun and meticulous and really, really cool. And educational,” he adds, rattling off a long list of parts that he replaced, re-greased, and adjusted in the process of restoring the mountain bike he now rides several times a week. Hodges, who spends his free time practicing swordplay and learning guitar, says he is now thinking of becoming a bike mechanic. This type of culturally-driven, community of cyclists that continues to invest in collective well-being is a thrill to realize in Vancouver. It reminds me of BICAS in Tucson, AZ where mentoring, socializing, inclusive promotion of fitness and ‘people-powered’ transportation has become a huge source of community pride. Thanks Kickstand! A very cool, inspiring and informative article about creating ‘community’; educating for the future; job creation; and environmentalism with the ‘bike’ as the catalyst. I live up the drive on Commercial street, am an avid cyclist and community promoter of arts and culture thru out Metro, including two cycling events; the BIKEnnale and the TOUR de BIENNALE, both which encourage getting out and about our community via the bike and taking in the OPEN AIR MUSEUM the Biennale brings to the community . Thanks. A great read and encouraging movement. I live in Kelowna, and it would be great if the folks behind this initiative in Vancouver could stimulate something similar in this city. Kelowna is probably one of the best cities to ride in in Canada, given dry weather and a long potential cycling season. However, I have heard that per capita car ownership is highest in this area also. Would love to have more people realizing they can commute by bike to work and on errands, not just do the Lycra thing in mass groups on weekends and evenings. The exercise and socializing angle is excellent, but it would be great to displace more cars from the road, and see healthy commuting becoming commonplace. If I ever make it back to Vancouver, I can’t wait to visit this Kickstand!